Recently, my Aunt Mary came to visit. Now, my Aunt Mary is ten kinds of awesome and you know that. She was very fun to hang out with and extremely helpful around the house. And also understanding, because my house is not clean. I don't even shoot for clean anymore. I shoot for not embarrassing. And since even that fails most of the time, I just try and make sure my friends have really low expectations where my house is concerned. That was working out pretty well for me, until Aunt Mary came to visit. Now I have been shamed into trying harder. Here's what happened. Right after she arrived, we were sitting around the table eating lunch and giggling and she started telling me about what it was like when her mom would come over to her house. No matter how clean Aunt Mary's house was, it was never clean enough. She would spend hours tidying and mopping and scrubbing and getting my cousins to scurry around helping her. And it was always still a little too dirty. Her mom would walk in the front door, look around, give a righteous sniff of disapproval and shake her head slowly as if to say "Well, I can see you didn't bother to clean on my account..."
I know the feeling. Except I barely even try anymore. It must be very disheartening to make the effort and still fall short. 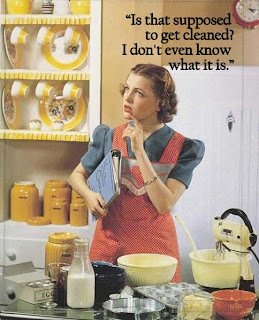 Part of the reason I don't try very often (other than the TOTAL, SOUL-SUCKING FUTILITY) is because I usually get my B on when I'm in a cleaning frenzy. Everyone in my house, while happy to have clean bathrooms, is not so happy to deal with the Mean Mommy Voice that comes with sparkling toilets. 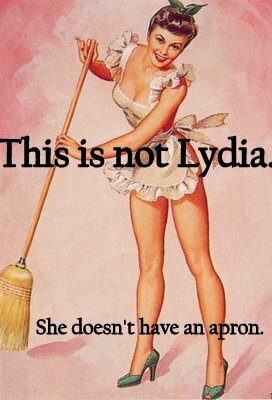 And even on the rare occasions when my house is "clean", it's never grandma clean. You see, in Aunt Mary's world there are two kinds of clean: regular clean and grandma clean. "Regular clean" is the kind of cleaning my sorry house receives maybe twice a year, usually right before we have visitors. Or host Thanksgiving. Or my husband's boss comes to dinner. But that's how clean her house is every day. "Grandma clean" represents a completely whackadoodle, OCD level of hygenic perfection that no sane person can possibly achieve. No offense to Aunt Mary's mother. One of the examples I was given included scrubbing the inside of the hood over her stove once a week so that it always remained white glove spotless. I was like: "Whuck? 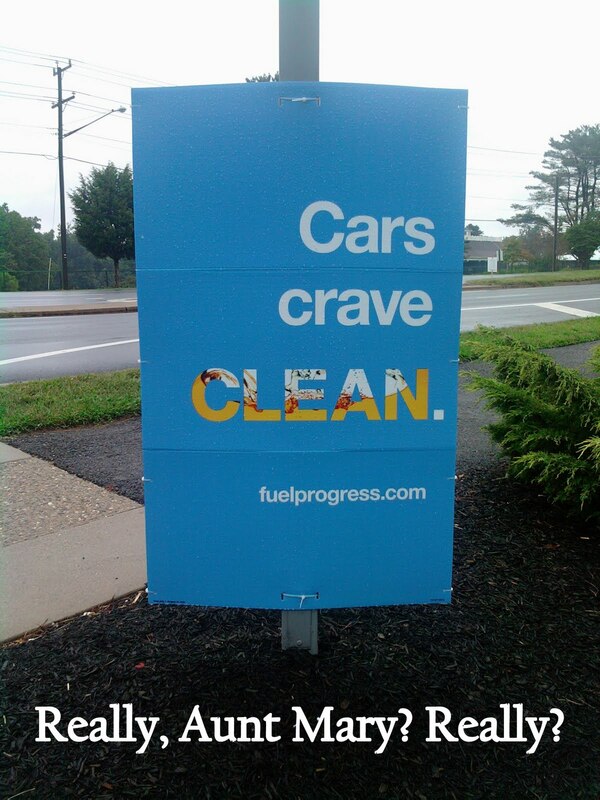 You're supposed to clean that? I had no idea..."
Aunt Mary didn't look surprised when I said that. But Aunt Mary is not judgmental. She's the sort of person who falls asleep on park benches and she's fine with that. She's also a very useful and helpful kind of lady. She asked me if I would get offended if she cleaned some things while visiting my house and I was like: "HELL NO. Go on with your bad self." So now the glass in my light fixtures is polished. Again, I don't think that was ever on my radar. I mean, I'm just trying to keep the carpet from being crunchy. Polishing things is not on my list. And my kitchen floor is mopped and the the floorboards have been scrubbed. Also, I caught her teaching Thumbelina to wipe down walls with hot water and clean rags. Wow. I know. I have clean rags? Actually, she bought them for me at Target but that's beside the point. Aunt Mary never made me feel bad about it because she kept telling me that when she visited people with small kids, she didn't want to make them feel like they had to bend over backwards to make the house perfect. It was more fun just to hang out and play. And if she got bored, maybe she'd clean something. And I believed her and I was so relieved because I tried to clean up for her, honestly I did. But it was just such a cluster of Cheerios clinging to everything and trash not being taken out and random pairs of Spiderman underpants of questionable vintage sticking out from under the couch that it wasn't possible. It was gross. God bless her. She didn't seem to care. She just knitted mittens and colored with the kids and cracked jokes and occasionally cleaned something. I was shocked and said: "Aunt Mary, are you saying my car wants to be clean? Did you just give my van the righteous sniff. OH. MY. GAWD. You totally just righteous sniffed me." She looked a little sorry and was like: "Well, the house I understand... But this? This is pretty bad." And then she and all three of my kids laughed their heads off at me while making sniffing sounds. And I made the made the mistake of telling Kate about it later and she was like: "You sort of deserve the righteous sniff. The Big White Tampon is vile. The last time I was in there I accidentally sat on an old grape juice box and I'm pretty sure wine came out." That's true. And the old Ford Tampon smells a lot worse in heat of the summer. Wait, that was gross wasn't it? I don't even care. I've officially hit rock bottom. I'm starting a 12 step program for filthy van owners called "Victims of the Righteous Sniff". "Hi. My name is Lydia and my van is disgusting and I have to go clean it now". Labels: Aunt Mary, housework, whuck?